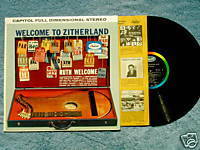 Capitol ST1471 RUTH WELCOME Welcome to Zitherland LP; German-born zither player popular on recordings and in New York City. This album includes "Summertime in Venice", "The Girls of Rome", "Ich bin gut aufgelegt", "At Last, At Last", "Autmn Leaves", "Vienna, My Love". Produced by Andy Wiswell. Vinyl is excellent; cover is VG; inner sleeve features covers of other 1950s and 1960s Capitol Recordings.